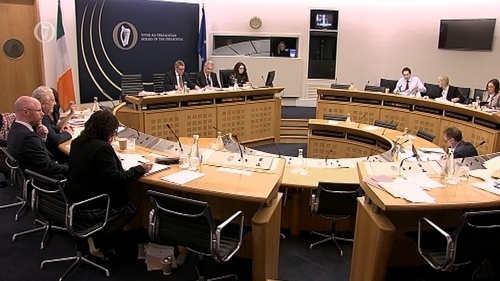 The Oireachtas Select Committee on Health has concluded its first day of deliberation over amendments to the Regulation of Termination of Pregnancy Bill. The Committee has concluded ten sections out of 26 sections, in which there are 180 amendments. So far the Minister for Health, Simon Harris, has not accepted any changes in the legislation. However he said he would consider some of the amendments. The committee will continue its work tomorrow when discussion will centre around a number of amendments by deputies who are against abortion. Ten Independent TDs and the suspended Sinn Féin TD, Peadar Tóibín, have jointly tabled a number of amendments. They want the legislation to include provisions for the use of ultrasound imaging 24-hours prior to termination, that women will be offered information including a DVD when seeking abortion-inducing drugs and that there would be a "dignified disposal of foetal remains". The group has also sought to amend the legislation to ensure that no healthcare worker will have to participate in carrying out or make arrangements for a termination, if they have a conscientious objection. Last week, the Irish College of General Practitioners agreed to hold an Extraordinary General Meeting after it received a petition of hundreds of signatures from GPs, who are concerned about the introduction of the abortion legislation and the expectation around their involvement in the service. GPs described the decision by the ICGP to hold the meeting on 2 December as "wholly unacceptable", and accused it of ensuring that the voice of mainstream General Practice would not be heard by legislators. The first amendments to the legislation that were discussed centered on the title of the bill. A number of TDs sought a change in the title of the bill. The amendment tabled by Sinn Féin's Louise O'Reilly requested that the title: Regulation of Termination of Pregnancy, change to: Access to Healthcare by Women Seeking Termination of Pregnancy. Ms O'Reilly said the only reference to "access" in the bill is in the offences section. She said the amendment would show the intention of the legislation and its purpose - that women have access to terminations. The Minister for Health said everyone who voted for repeal, voted for access to a service that is not currently available to women in Ireland today. Mr Harris said the title of the Bill had been drafted to reflect the language used in the 36th Amendment to the Constitution Act 2018, which amended the Constitution to provide that "provision may be made by law for the regulation of termination of pregnancy". He described it as "a technical legal title" and said that changing the wording would not be in line with the legal requirements and advice he had received. That advice was to keep the title of the bill consistent with the wording of the Constitution. Independent for Change TD Joan Collins said the substitute wording put forward, reflected the outcome of the vote on 25 May and she asked Minister Harris to reconsider. The Minister said he would need to take legal advice, adding that no one wanted to undermine legal certainty of the legislation. Solidarity-People Before Profit TD Bríd Smith requested that the committee see the legal advice given to the Minister. Simon Harris suggested a briefing of in that regard. Fine Gael's Bernard Durkin and the Fianna Fáil Deputy Margaret Murphy O'Mahoney said the committee needed to stick as closely as possible to what people voted on in the Referendum. Mr Durkin said people came to a resounding decision based on the published heads of the bill and advised the Committee not to deviate from that. Ms Murphy O'Mahoney said if the committee started its work by changing the title of the Bill, "the whole thing will go up in the air". She urged that the legislation reflect what the people voted on in the Referendum. Ms O'Reilly withdrew her amendment, with a view to examining the matter further between Committee and Report stage of the bill. Mr Harris offered to meet with transgender representatives to discuss the bill. A number of TDs sought to make the bill more inclusive of trans people by replacing references to women and females in the legislation with person. Mr Harris said he wanted the legislation to be trans-inclusive, however he said he did not want to accidentally cause adverse consequences for trans people in accessing services. He pointed out that there are many pieces of legislation that refer to women, mothers and motherhood that apply seamlessly to trans men. Introducing her amendment, the Independent TD Carol Nolan voiced her opposition to terminations being paid for by taxpayers. She said the injection of €12 million to provide the service as a starting point was "unacceptable". She said she was vocalising concerns of her constituents, including yes voters. The Minister for Health said women are taxpayers and the service is for women. Mr Harris accused Ms Nolan of trying to subvert the will of the people. He said the legislation was about looking after and caring for women and it was not for him or Ms Nolan to judge them. While he acknowledged that free access was a policy decision, he pointed out that it would be voted on in the Oireachtas. Minister Harris described her amendment as "discriminatory". Ms Nolan said many of those who contacted her with concerns, were women. She accused the Minister of "a cheap shot" when he referenced her former party Sinn Féin as being supportive of the legislation. Ms Nolan also said she did not bow to pressure like the Minister did. "You once were pro-life then when you realised when it wasn't popular or indeed wouldn't guarantee you your Ministry, then you decided to turn, I'm not that sort of a person, OK? ", she said. Minister Harris agreed to move the offences section of the abortion legislation to another part of the bill. At the moment, the offences section is located at the front of the bill. During second stage discussion in the Dáil which preceded the current Committee stage, a number of TDs asked that the section be relocated. Mr Harris has told the committee that he would seek to bring forward amendments to put the offences section in another part of the bill. This afternoon, a number of TDs requested removal of offences from the bill in full. The Minister said the bill to ensure regulation and deleting offences from the bill altogether would lead to unintended consequences which would leave some women vulnerable. Fianna Fáil TD Stephen Donnelly said that on a personal level, he did not agree with offences being in the legislation, however, he said they were in the heads of the bill and voters were aware of that on 25 May. The Minister said there had to be legal and illegal elements to the bill otherwise, the legislation will go beyond the recommendations of the Joint Oireachtas Committee on the Eighth Amendment.